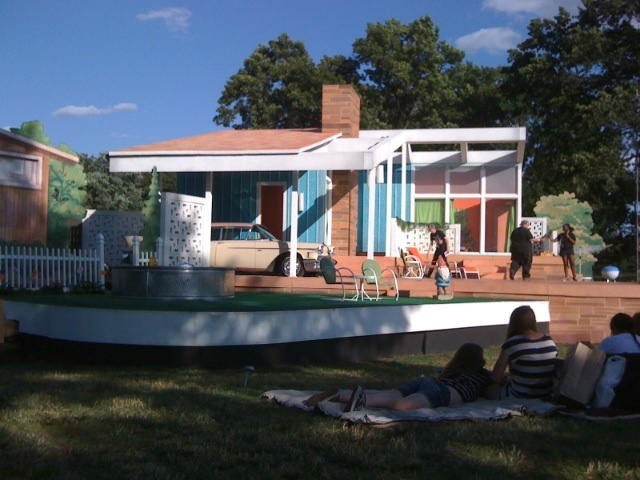 Once again, I attended the Shakespeare Festival in St. Louis's historic Forest Park. This year's performance was a 1950's-inspired rendition of The Taming of the Shrew. 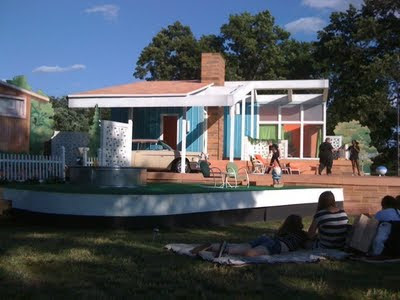 The play was set in the backyard of a rich "Lord's" home, complete with 50's style patio furniture, aluminum swimming pool, and vintage Chevy sedan. It was, as it always is, a great event...my absolute favorite thing to do in the city. I met some friends there this year, so I packed my picnic basket with things to share...pressed sandwich, truffled popcorn (aka "crack corn"), and lemon curd with strawberries. My first attempt at making this recipe resulted in a too thin--albeit still tasty--curd. I think I was afraid of over-cooking or over-heating the mixture & ending up with a curdled mess of egg yolks. So, I probably under-cooked it slightly, as it didn't get as thick as I had expected. Still, it made a nicely tart & refreshing dip for sweet strawberries. Put all the ingredients in a medium heavy-bottomed saucepan and stir with a heatproof spatula to moisten the sugar. Put the pan over medium-low heat and cook, stirring without stopping, until the butter melts and the mixture thickens like custard, 4 to 6 minutes. Keep your eyes on the pan because the curd can curdle quickly. It is cooked enough when you can run your finger along the spatula the curd doesn’t run into the track you’ve created. Don’t worry if the curd looks thin at this point – it will thicken more as it cools. Remove the pan from the heat and scrape the curd into a heatproof jar or bowl. Press a piece of plastic wrap against the curd to create an airtight seal and cool to room temperature. I used the few farmers market eggs we had left before using a couple from the supermarket. Can you tell a difference? The farm fresh egg yolks are much more orange, which made the finished lemon curd deep yellow in color.